Daniel Cormier makes the first defence of his Light Heavyweight Championship as he squares off with towering Swede Alexander Gustafsson in Houston, Texas. While Johny Hendricks vs. Tyron Woodley was scrapped from the card after a late weight-cutting incident, it remains an intriguing lineup of UFC action. Here we break it all down. Eye is one of more the quicker girls at 135 and definitely has some fast hands. She has a quick jab that she throws very frequently and will mix up her attack with a left inside leg kick. Now Eye has some good offensive boxing skills but she has some major defensive problems. Every time Eye throws a jab, her jab hand drops to her waist and her chin goes straight up in the air. Every time she finishes exchanging and tries to pull out of danger her chin is just straight up in the air. She tends to throw the jab, right hook combo and once again her chin keeps tipping up in the air. These flaws make her super prone to overhand rights or right hooks. And in wild exchanges she likes to pop the jab to get away but a nicely timed overhand right will catch her every time. We saw this in the Kaufman and Tate fights for example. Eye's bad habits vs Kaufman got her tagged with several overhands and hooks in the 2nd and 3rd in a fight that I thought Kaufman won. Tate landed her overhand right at will as well. Eye is very sharp and crisp offensively but definitely has some holes in the defense. Pena, on the other hand, likes to get in her opponents face right away and throw heavy shots including an overhand right. She is an excellent pressure fighter that just likes to brawl and punches don't seem to phase her at all. We don't get to see a lot of her standup because she prefers to just get the fight on the mat. All in all, Eye may be a better boxer overall, but Pena can definitely capitalize on some openings. Pena has a clear advantage on the mat in my opinion. When she gets on top, she is not looking to grind out and win rounds, she is looking to land big punches and finish. We saw this on TUF vs Bazler, Moras, Rackozy, and most recently Dudieva in her last fight. She has very good chokes as well and won't hesitate to attempt them either. Eye on the other hand, is not a takedown threat. She does have an incredible submission win via standing arm triangle over Zoila Gurgel dating back to her Bellator days which is the lone submission victory of her career. Eye has decent takedown defense, but when she does get taken down she struggles off her back bigtime. 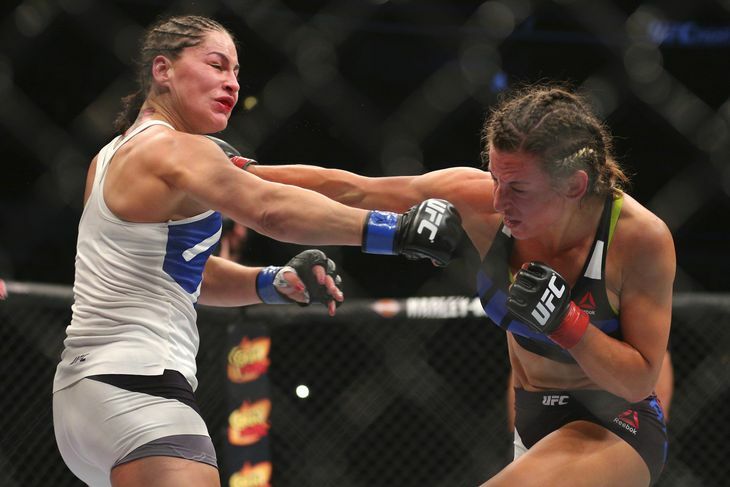 In fact, when she has been taken down in her UFC career, Eye has never worked her way back up to her feet, not once. She just ties up a leg hoping for a stand up. All in all, Pena has a big advantage on the mat. Bader: D1 wrestling, top game, power, "grind"
Evans primarily entered this sport as a straight wrestler and quickly evolved to a guy who was more than comfortable striking with his opponents. Evans has always been very quick and explosive even as he is winding down towards the end of his career. He has a a nice jab, left hook combo and throws right hands excellent in flurries. He has a excellent overhand right that is very accurate and although he doesn't implement his kicks as much as he used too they are still very powerful. He's become very technical in his striking but at times a little bit too technical and overthinks and tries to be a little to cute or fancy. Rashad can definitely put more punches together compared to his opponent Bader. Bader also came into this sport as a straight wrestler and has always had decent power and explosiveness. In my opinion, Bader's striking hasn't improved too much in the way that some think. Bader does nor put punch combinations together frequently. He throws an inside leg kick, a big looping overhand right, which is his best punch, and an occasional left hook. He has recently added a switch left kick to his arsenal, but his overall standup game is still very choppy and clunky. Bader does have power early but it's overrated in my opinion. Bader will swing hard early but as the fight progresses he does not like to exchange at all and he moves away and wants to go right into wrestling mode. His punches come really slow in Round 2 and on. For example in his last fight, he was out struck by a very rudimentary striker in Phil Davis. In the 1st he looked fairly good and then it got really sloppy and ugly and Phil out struck him. Like previously stated I just don't think Bader likes to exchange punches and get hit, he does have power early but that will die out in Round 2. In terms of chins they both have fairly decent one's. Bader has been finished twice and Evans once by strikes. All in all, I think Evans is a better striker in every aspect. This doesn't mean that Bader can't catch him early as Rashad is coming off a long layoff. Both men are D1 wrestlers, but Bader definitely utilizes his more than Rashad. Bader's bread and butter is his double leg and he won't hesitate too shoot in on anyone from any distance. He can be very sloppy and televised with the shot but when he does get on top he is very smothering and loves to implement that "grind". Bader would much rather stay on top and capitalize on positions then go for submissions but I highly doubt he can submit Evans. In fact, neither guy is a sub threat to eachother in this fight in my opinion. Evans is very similar to Bader in the grappling department. He would rather just grind guys out then go for submissions. When Rashad gets on top he likes to get side control and occasionally trap the arm and throw elbows. I do think Rashad has better ground and pound as evident in his wins over Chael, Ortiz, and Forrest Griffin. All in all, I think the wrestling will be nullified in this fight for the most part. Each guy is very advanced in this area. If anyone will be looking to initiate this more I think Bader will but I just don't see either guy being able to consistently capitalize on takedowns. I think most of this fight will take place on the feet as the each guys wrestling will be negated. I think Bader might even rock Rashad early, but as the fight progresses I think Rashad's ore efficient technique will prevail and make Bader look off and sloppy. Gustafsson has some of the most crisp, fluid hands in MMA, and this has most evident in his fight with Jon Jones in which he could have gotten the nod. Not only are his hands good but he has excellent teeps and frontkicks and high kicks. He mixes them up really well in sequence as well. He is very good at distance implementing his long straight punches and front kicks, but I'm not sure if he should attempt that much kicks considering DC's grappling ability. DC is a basic striker with decent power. He keeps it very simple as his main goal is to get inside and get his hands on his opponent to clinch and get the fight to the mat. Gustafsson definitely has better weapons and a more diverse attack but I think hell have to remove some techniques from his arsenal in this fight. Gustafsson did recently get knocked out by Rumble in his last fight, but everyone gets caught at some point and with the type of power Rumble has there is really no shame. All in all, Gustafsson has to keep this fight at a distance and laterally move well if he wants to keep DC off of him. Like mentioned previously DC ultimately wants to get in close and clinch and his chin is excellent. He took a series of overhands and left high kicks from Rumble and kept moving forward and I really don't see Alex being able to hurt him with anything. All in all, I do think Gustafsson is the better striker but he has to stick and move efficiently if he wants to be effective. Cormier without a doubt has an advantage on the mat in this fight. He has suffocating top control and drains his opponent's energy and makes them break. Gustafsson also has improved his grappling drastically since his lost to Phil Davis and showed his improved wrestling defense vs Jon Jones. Gustafsson probably won't be initiating any grappling situations, and Cormier will be looking to deep on Alex's hips with the first chance he gets. Cormier chains his takedowns very well, transitioning from a single to double leg and trapping a leg in attempt to get on the back. His grappling is just more advanced than Alex's plain and simple. I actually think Gustafsson will have a strong 1st round but I think somewhere in the late 2nd or 3rd round, Cormier will take over this fight and drain him with that suffocating grappling. Light Heavyweight gold is in the balance in Houston - who will prevail as the ruler of the division? Daniel Cormier makes the first defence of his Light Heavyweight Championship as he squares off with towering Swede Alexander Gustafsson in Houston, Texas. While Johny Hendricks vs. Tyron Woodley was scrapped from the card after a late weight-cutting incident, it remains an intriguing lineup of UFC action. Here we break it all down.